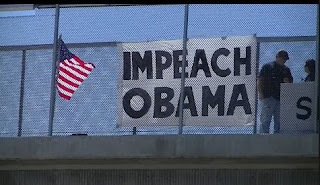 A Long Island college student who was arrested for hanging an “Impeach Obama” banner from a Long Island Expressway overpass is suing the Nassau County Police Department for violating his right to free speech, according to a Long Island federal lawsuit. Danny Martins, a senior at Hofstra University who says he’s a member of the school’s Libertarian Club, was charged with disorderly conduct in June 2014 after hanging up the message and the American flag from a pedestrian walkway in Jericho. But a judge eventually tossed all charges against the libertarian activist after citing his right to free speech. Nassau County prosecutors initially argued that the activity posed a safety hazard. 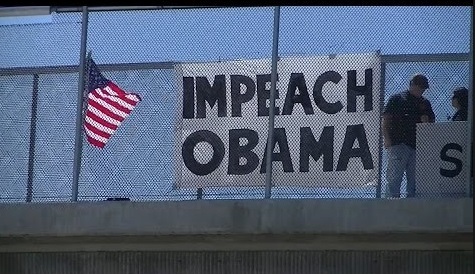 Martins, who routinely hung political messages from overpasses beginning in 2013, filed suit against the Nassau department as well as individual officers involved in his arrest.